The manager of an early century commercial building was looking for ways to enhance architectural features of common areas such as entrances, elevators, and stair railings. These areas contained various period brass components that had been severely tarnished over time. The customer contacted us for direction, they needed a solution that would bring back the original finish, but also eliminate tarnish from developing in the future. Because these were architectural features, many could not be removed, so we sent our people to the customers site to perform the needed polishing. 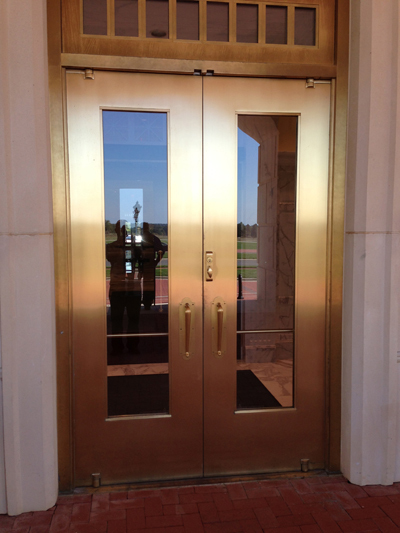 To achieve the desired #6 satin finish we utilized side grinders with Scotchbrite pads, this allowed us to quickly polish the large door surfaces. Finer detail was also polished with Scotchbrite but by hand, this combination of large scale polishing and hand polishing of the intricate details allowed us to finish this project in just 3 weeks. To address the customer concerns about re-tarnishing, we finished all of the affected areas with a durable clear lacquer coating. 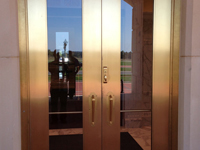 Product Description These visual brass components in a commercial building were buffed to give an attractive satin look.